SimLife LED Plant Grow Light Kit Indoor Herb Garden Desktop USB Grow Lamp Auto Mode for Plants Hydroponics Greenhouse Office Great for Growing Fresh Herbs, Small Plants, Great Gift (White) by SimLife at Community Greenhouse. MPN: 4332684247. Hurry! Limited time offer. Offer valid only while supplies last. Your Mini Indoor Garden!Love gardening but your space is limited? Get yourself this smart planter by Simlife and grow your own plants from now on. Love gardening but your space is limited? Get yourself this smart planter by Simlife and grow your own plants from now on. Ideal for indoor use, either on the kitchen counter, window or living room. Grow your favorite herbs all year long without worrying about weather conditions. ?LED lighting?The smart planter equipped with professional full spectrum plant LED grow lights, which integrates optimal wavelength and intensity, that provide lighting similar to sunlight which plants need for photosynthesis. ?Three system settings?The LED lighting system has 3 settings, ON, AUTO, and OFF. When ON mode is selected the LED lights will stay on. When set to AUTO mode, the LED lights will come on when the smart planter senses sufficient amount of direct or indirect surrounding light. The light sensor is located at the front of the smart planter. When OFF mode is selected the LED lights will stay off. 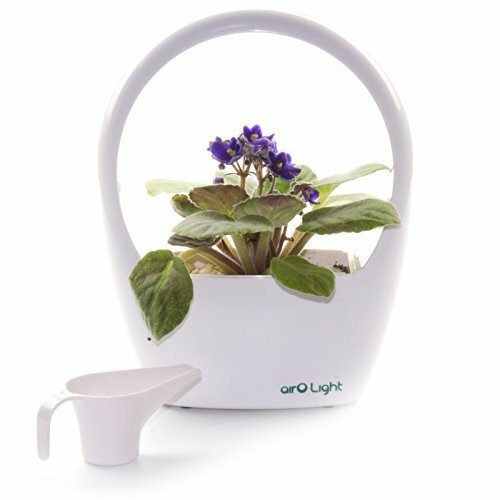 ?Removable soil container and Mini watering pot?The smart planter has removable soil container can make you plant all kinds of plants easily, besides, you can use the mini watering pot resease water into the soil. ?DC and USB power jack?The smart planter can be powered by an adapter or via USB cable. If you have any questions about this product by SimLife, contact us by completing and submitting the form below. If you are looking for a specif part number, please include it with your message.